^ Harper, Douglas. "tally". Online Etymology Dictionary. ^ A very brief history of pure mathematics: The Ishango Bone Archived 21 July 2008 at the Wayback Machine University of Western Australia School of Mathematics – accessed January 2007. Henkelman, Wouter F. M.; L. Folmer, Margaretha (2016). "Your Tally is Full! On Wooden Credit Records in and after the Achaemenid Empire". In Kleber, K.; Pirngruber, R. (eds.). Silver, Money and Credit: Festschrift for Robartus J. van der Spek on occasion of his 65th birthday on 18 September 2014. 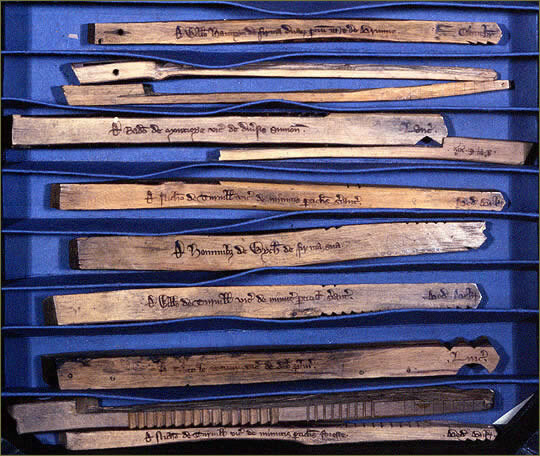 Publications de l'Institut Historique-Archéologique Néerlandais de Stamboul. 128. Leiden. pp. 129–226. This page was last edited on 2 April 2019, at 16:13 (UTC).